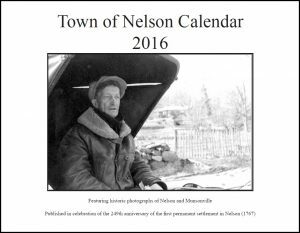 From 2014 to 2017, the Nelson History Roundtable published calendars with photos depicting themes in Nelson history. In reproducing these calendars on this website, we have to the extent possible, kept to the original formatting, with the idea that this archive represents the actual calendar, rather than just the scenes and information presented. Because so many of the pictures have intricate detail, we have opted to present them in a large format. We realize that the way these images and captions will display on some monitors will require scrolling to see the full content, but it is not feasible to have a format where it works perfectly for each type of display. The calendar does render well on mobile devices: a tablet is a good way to view. 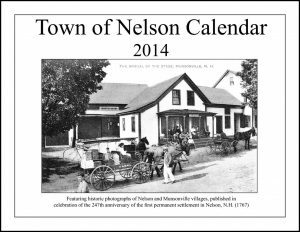 The 2014 calendar features historic photographs of the villages of Nelson and Munsonville – the two main settlements within the town of Nelson. 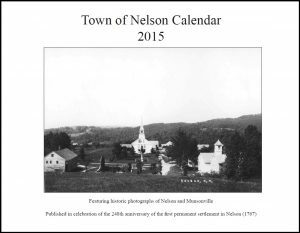 The 2015 calendar includes historic photographs of the Nelson landscape, taken from hilltops, lakes, and even from the air. The earliest settlers may not have come primarily for the scenery, but surely it was a powerful influence on them and on successive generations of people who have loved the hills of Nelson and called this landscape home. The 2016 calendar features historic photographs, most from the first half of the 20th century, depicting local people at work. It took effort and ingenuity to sustain the hill farms, households, and town institutions of Nelson, and they did it in an era when most homes lacked electricity, the chain saw was just a dream, telephones were few, and travel was slow. Need a part for a stubborn pump? You knew Frankie Upton would tinker with it until the darn thing worked. Need some music for the Old Home Day picnic? You hauled the piano out onto the church lawn and asked Bessie Hardy Lyman to play. Need refrigeration? You cut 100-pound blocks of ice on one of the ponds and dragged them to your ice house. Need 35 cords of wood cut up and stacked for the winter? You hired Bobby Curtis. 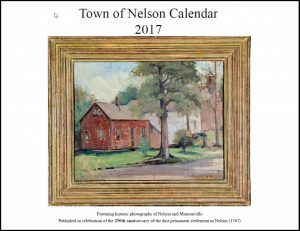 The 2017 calendar features historic photographs of homesteads in Nelson and Munsonville. While there are no plans at this time to continue calendars past 2017, the types of photographs and captions which the calendars have presented may be found in various sections throughout this website.